Kiwis love to travel, taking more than 200,000 short-term overseas trips per month. Travel money cards, which give travellers the ability to lock in an exchange rate before they leave, can go a long way to helping keep holiday costs under control. “A travel money card is a debit card with chip and PIN protection that enables you to pre-load a number of foreign currencies before you travel,” said Canstar General Manager – New Zealand, Jose George. Travel Money Cards also have the advantage of not being linked to your other bank accounts, which can be an easy and secure way to carry multiple currencies in your wallet. Source: Providers’ websites. Exchange rates are current as at 15 July 2016. “The exchange rate difference may not sound like much, but it does add up. Based on the exchange rates in the table above, someone buying $6,000 worth of Euros, for example, could end up with anywhere between €3,708 and €3,748 Euros,” said Mr George. Which card offers outstanding value? 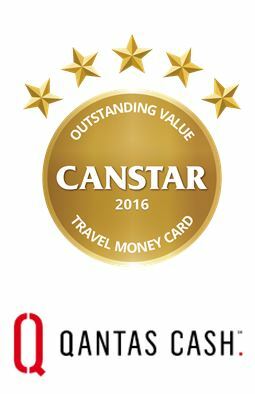 Canstar has analysed the costs and features of 4 travel money cards, with Qantas Cash taking the 2016 Award for Outstanding Value – Travel Money Card. The Qantas Cash card is a pre-paid, debit MasterCard. It can be used to pay for goods and services in person or online, and to make withdrawals at millions of MasterCard ATMs around the world. You can load up to 9 foreign currencies on the Qantas Cash Card – NZD, AUD, CAD, EUR, GBP, HKD, JPY, SGD, and USD. You can lock in exchange rates on up to 8 currencies before you fly. You do need to be an existing Qantas Frequent Flyer member in order to attain a Qantas Cash card; however, you can apply for the card immediately after signing up to this rewards program. Because the Qantas Cash card is connected to your Qantas Frequent Flyer membership, you earn Qantas Points on all eligible purchases made at home or overseas. “As well as a competitive exchange rate, the Qantas Cash card has very few fees; that’s a win/win for travellers,” said CANSTAR’s Jose George (see fee summary table on following page). Responding to the Award, Fiona Enh, Head of Qantas Cash, said the Card has been used in 178 countries across the world, with the ability to lock in exchange rates, control, safety and security some of the most important features that their customers look for. And then, of course, there are rewards points. “You can use Qantas cash as you would any normal credit or debit card overseas, whilst earning 1 Qantas point for every $1 of spend,” she said. Canstar congratulates Qantas Cash Card on its win. The table below summarises the fees and charges you can expect to see on the 4 travel money cards rated in New Zealand. To find out what these fees mean and how to avoid paying some of them, read on below. Source: canstar.co.nz database as at July 2016.